Typopress is a full-service printing company, located in Nahr El Mott, Lebanon. As a leading printing company, Typopress is the second biggest printing house in Lebanon. Our in-house team understands your printing needs. You can completely rely on Typopress to execute all your printing needs. Typopress printing services go beyond the Lebanese territories to cover the Arabic as well as the European markets, some of our clients include for example but not limited to the ministries of education in U.A.E., Syria, Jordan…etc, in addition to Arabic and international publishers; moreover, in recent times, Typopress is responsible for the print production of the Syrian government school book project. At Typopress, we serve our clientele having an essential objective which is summarized by "Exceeding each customer expectations". 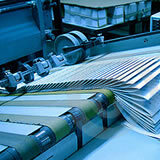 Each printing task begins with digital prepress services. At Typopress, we make sure that your documents are quality checked and ready for print. Our proofs are confirmed with state-of-the-art technology to ensure that what you see precisely stands for the ending printed product. We, at Typo Press, take pride in our work; our deliverables reach their destination in the highest quality possible for the best price in the market and most importantly at time! All our efforts are achieved thanks to a dedicated staff of professionals and high-tech machinery.